Southwestern College's women's soccer team finished 17-4-1 in 2017 to post a rather memorable season. 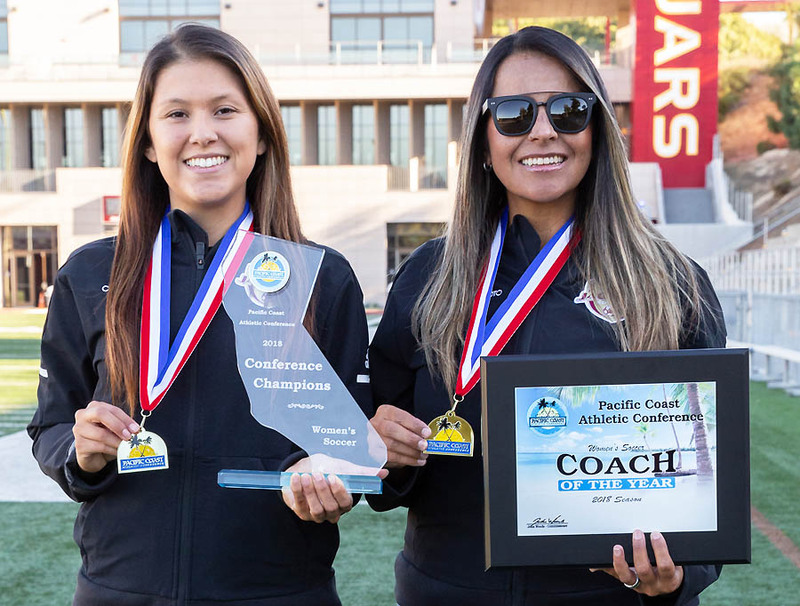 The Lady Jaguars will certainly remember the 2018 season after winning the Pacific Coast Athletic Conference South Division championship. It is the first known women's soccer conference championship in the history of the college, according to head coach Carolina Soto. "San Diego Mesa, the previous champions, were predicted to win it again," Soto said. "There were very few who believed Southwestern College's women's soccer team would ever achieve what we have this season. The players kept that in mind and it served as motivation for them throughout the season to prove people wrong. They were determined to earn the respect they deserved." Southwestern finished conference play with a 6-0-2 record (six wins, two ties) while Mesa finished with a 6-2-0 record (six wins, two losses) to place the Lady Jags in sole possession of first place in the standings. Grossmont finished in third place with s 2-3-4 record, followed by San Diego City in fourth place with a 0-4-4 record and Imperial Valley in fifth place with an 0-4-3 record. Southwestern finished the season with an overall 12-6-4 record while Mesa was 11-5-5. Grossmont finished 7-6-5, while City was 3-12-5 and Imperial Valley was 2-14-4. Soto said her team's mindset started from training camp onward. "Since day one of summer conditioning training, the mindset was to work relentlessly to continue the momentum that we carried over from last season," the SWC coach explained. "We came up short last year not winning the conference title while pretty much having an undefeated season. "We made the playoffs and lost in PKs, so the squad knew not to be overconfident, to not cut any corners, and returning players set a high bar for all new players. We had players who demonstrated grit and that became part of the team's identity. "The team knew what bringing a championship title to the college and to the South Bay community meant. They played with heart and they were determined to make history. Many of our returning players felt like last season we didn't accomplish the goals we had set and this year they were determined to leave their legacy." Top returning players included Andrea Camacho (Eastlake), Ylieana Betancourt (Chula Vista), Damaris Aguila (Chula Vista) and Makayla Saenz (St. Pius X). Impact newcomers included Anais Ortiz (Preuss Academy), Daisy Gonzalez (Mar Vista), Veronica Romero (Hilltop), Kimberly Mederos (Chula Vista), Karla Garcia (Montgomery) and goalkeeper Sharon Montoya (Castle Park). Aguila and Mederos tied for the Lady Jaguars scoring lead each with 32 points. Aguila recorded 12 goals and eight assists in 21 game appearances while Mederos had 14 goals and four assists in 16 game appearances. Gonzalez (10 goals) and Romero (six goals, eight assists) tied for third in team scoring each with 20 points. Ortiz recorded 14 points on five goals and four assists while Osuna had 11 points on four goals and three assists. Aguila, Mederos and Gonzalez each recorded three game-winning goals while Romero scored two game-winning goals. Montoya started 20 games, posting a 0.82 goals-against average with a .813 save percentage. As a team, Southwestern recorded 10 shutouts over the course of the season. The Lady Jags kicked off the season on an ominous note with an 11-0 victory over Victory Valley on Aug. 28. Southwestern scored 62 goals in 22 games for an average of 2.82 goals per game while allowing an average of 1.00 goals per game. Southwestern had six players selected to the all-conference team: Aguila, Romero, Camacho, Mederos, Ortiz and Gonzalez. Aguila earned recognition as the PCAC South Player of the Year while Romero earned honors a the PCAC South Defensive Player of the Year. Soto earned accolades as the PCAC Coach of the Year. Grossmont's Julia Hartman (20 points in 14 games) received recognition as the PCAC Offensive Player of the Year while Mesa's Alyssa Warner (0.59 GAA) was named the PCAC South Goalkeeper of the Year. While the 2018 SWC team made history with its conference championship, the ending to the season was similar to that of the previous season: the Lady Jaguars lost their opening playoff game. Mesa, in a bit or irony, came out on top by a score of 2-0 in the teams' playoff match on Nov. 15. "This season we played Mesa even though they are in our conference," Soto said. "We had beat them twice (in the regular season) but we came out short losing 2-0. Previous to these two playoff experiences (2017 and 2018) I believe our program had made the playoffs possibly twice in the program's history."